The birds are singing, the buds are blooming and the days are longer! Oh, Spring! I have missed you. I love when spring returns. I always feel energized and inspired. This time of year, more than any other, I feel pumped up and ready to go. This is when I start a dozen or so projects (I am not saying I finish them all, mind you) because the enthusiasm of this season just takes over. I find it so easy to recommit and refocus on all of the things that are most important to me. Not only that, I feel the powerful urge to PURGE on so many levels. My body craves nutritious green juices, my mind needs to organize and declutter and, on a deeper level, I am driven to simplify my life for the sake of my overburdened soul. It is not uncommon for busy moms like us to need to stop, take a deep breath, and realign ourselves with the ideas and practices that our most important to us. Spring is a perfect time to do that. In years past, I can remember wanting to make healthy adjustments to my life with a bit of "spring cleaning" but not knowing where to begin. With that in mind, I put together this useful list for all of us to help get us started. This list should allow us to utilize the inspiration of spring and make the most of it! This is a great starting point for you to spring clean your mind, body and soul. 3. Clean emotional "junk". Ill-feelings for another person or grudges have got to go. Use a strategy to free yourself of those kinds of emotional burdens. Journaling, a heart-to-heart talk or a guided meditation are some of the ways that might help you put that stuff behind you. Freeing yourself from those burdens will help you feel refreshed and light. 4. Re-commit to fitness. Take advantage of the warmer weather, the longer days and your extra energy. Try a new fitness routine or get back to one that you love. 5. Clean out the negativity in your life. Do this simply by crowding it out. Make space for more positivity by consciously inviting more of it into your life. 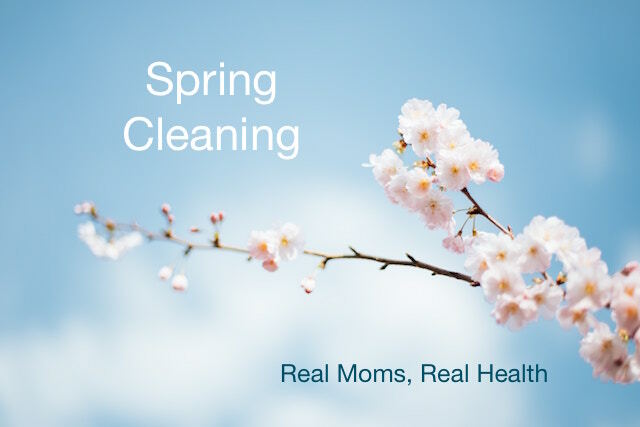 Start your day with a positive mantra, gratitude journal or join this week's healthy challenge in our online community, The Real Moms Collaborative. Spring is the perfect time to tidy up our life in all essential aspects. This list will give you a quick start to spring cleaning your life: mind, body and soul. Grab a FREE healthy shopping list! Join our awesome email community and get your free gift!